Extradition Off-Site is a series of event scores, sonic meditations, sound walks, and other participatory sound activities offered as a corollary to Extradition's concert programming. Designed to be performed by anyone, musician or non-musician, at the time and place of their choosing, these Off-Site activities are a way of drawing our audience more deeply into Extradition’s creative process, becoming interpreters of new experimental music in their own right. We encourage anyone who undertakes one of these pieces to share their experience via recordings, photos, text, etc. Please send links and commentary via our contact page and indicate whether we may post them on this site. Juniana Lanning, Are You Building Something? When we walk though space, we also walk through time, collecting the stories of each particular moment in each particular place along our route. Are You Building Something? 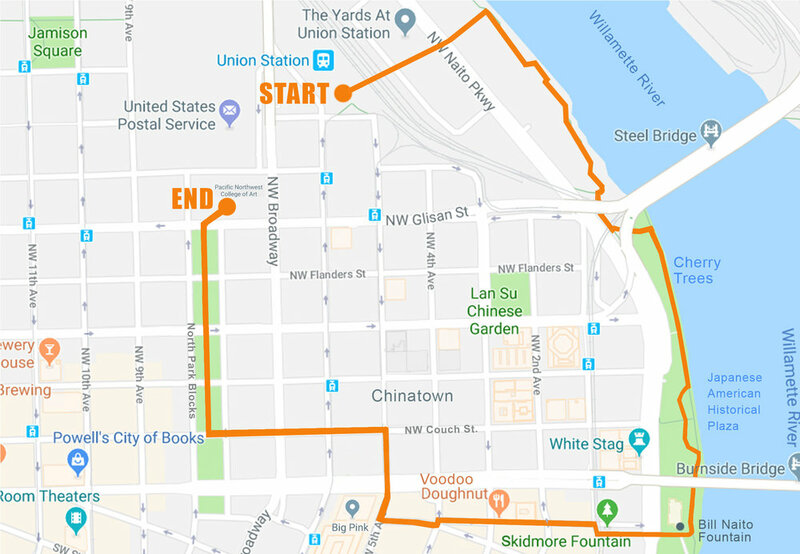 changes that relationship, capturing sounds along a specific route through portions of the riverfront, Old Town, and Chinatown neighborhoods of Portland, Oregon, USA, in late spring 2018, and augmenting them with additional field recordings and electronics. Designed to be listened to while walking that same route, the piece transforms the listener’s relationship with place and temporality, capturing voices and ambient city sounds like ghosts forever tied to their moment of sounding. Repeat performances of the walk in different seasons and weather revive those voices and sounds but at a greater remove from their context—potentially, for example, giving the listener an auditory experience of place on a summer day while s/he walks through a winter snowstorm. Are You Building Something? was offered as a companion piece to our 2018 summer concert. The audio track can be downloaded here. A route map and directions can be downloaded here. Presented as a companion to our 2018 Spring Concert, Self Composure #2 (Memory Sequence) (2018) is a new work in which ambient sounds are shaped into music entirely within the performer’s mind. Ben Glas is an interdisciplinary artist and composer based in Portland, Oregon, USA. You can download a high-res copy of the score here. You can download a high-res copy of the score here and listen to a recording by the Extradition Ensemble here.